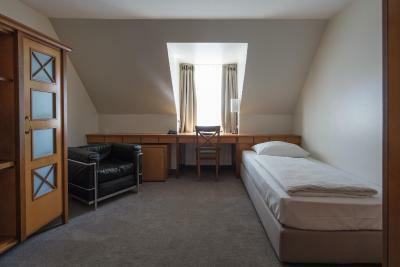 Lock in a great price for Parkhotel Schmid – rated 8.3 by recent guests! This is a little off the beaten track but still close to city. 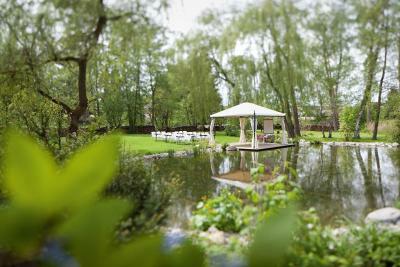 Lovely grounds and beer garden in the back. Nice community for a walk . The location and setting is great but the best thing about the hotel is the wellness centre with a pool large enough to swim lengths and sauna and other fitness and wellness facilities. Staff very welcoming and accommodating and parking is secure and right outside the proeprty. Facilities looked great - shame I had to work! Indoor swimming pool looked amazing but did not have any gear. Highly recommend. Liked the staff. Friendly and efficient. Bed was comfortable. Spacious room. Friendly staff. Perfect for a one night stay to proceed traveling next morning. Nice swimmingpool to refresh. 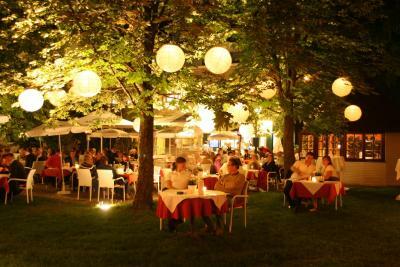 Relaxing garden (Biergarten) to have a drink. Dinner well served though atmosphere not really 'gemütlich' in an almost empty restaurant. Reason perhaps many guests attending the wedding which took place at the day of our stay. Obviously some music to hear and people around, but did not bother us. Was a wedding guest reception was held in the hotel which was well organized. Food was excellent considering they were preparing for 80 guests. 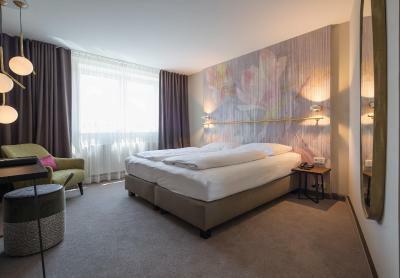 Room was decent size and facilities ok.
Parkhotel Schmid This rating is a reflection of how the property compares to the industry standard when it comes to price, facilities and services available. It's based on a self-evaluation by the property. Use this rating to help choose your stay! 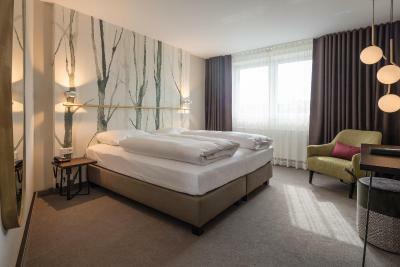 Conveniently located near the A8 motorway in the village of Adelsried to the west of Augsburg, this hotel offers a swimming pool, spa facilities and delicious international cuisine. 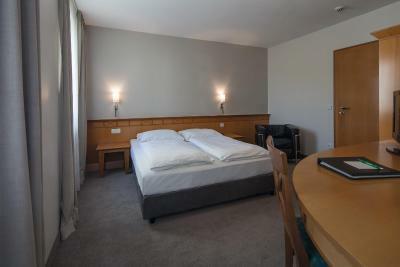 The Parkhotel Schmid provides a range of double rooms individually furnished in different styles. Go for a swim in the Caribbean-style indoor pool, and relax in the Finnish sauna, steam room, jacuzzi and gym. 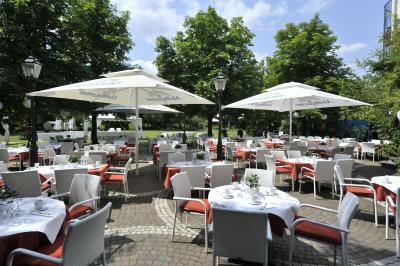 Treat yourself to a wide range of German or international specialties in the conservatory restaurant. 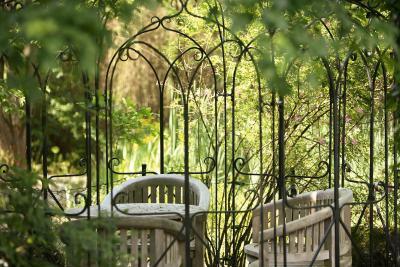 Enjoy a drink in the lobby bar or in the cozy beer garden in fine weather. Located in the Westliche Wälder (Western Forests) nature park, Parkhotel Schmid is the ideal base for a hiking or cycling break. 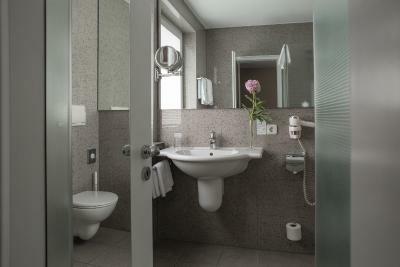 Parkhotel Schmid is only a short drive along the A8 motorway to the historic, Roman city of Augsburg. Parents and children will also appreciate the proximity to popular theme parks such as Legoland (20 minutes drive) and Playmobil (40 minutes drive). 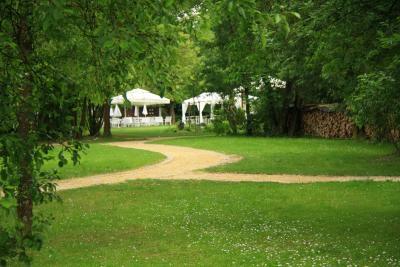 This property also has one of the top-rated locations in Adelsried! Guests are happier about it compared to other properties in the area. This property is also rated for the best value in Adelsried! Guests are getting more for their money when compared to other properties in this city. 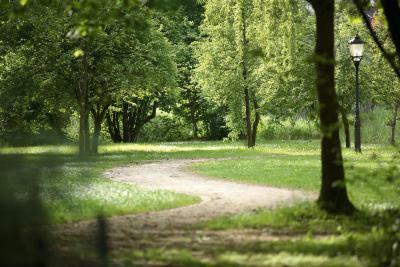 When would you like to stay at Parkhotel Schmid? 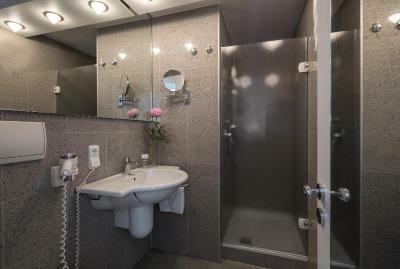 This triple room features a satellite TV, bathrobe and mini-bar. A double bed and a sofa bed are also included. 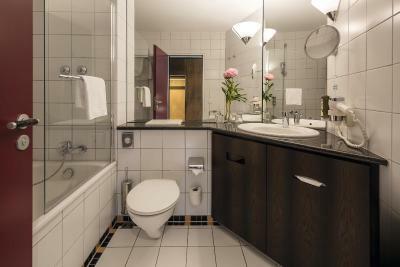 House Rules Parkhotel Schmid takes special requests – add in the next step! Parkhotel Schmid accepts these cards and reserves the right to temporarily hold an amount prior to arrival. Please note that extra beds are subject to availability and must be approved by the property in advance. Please note that renovation work will be taking place in the lobby between 01 January and 28 February 2019, but alternative space will be made available for guests. There was loud music comming from the ground floor (my room was on the 1st floor) as there was a business party of some kind if I'm not mistaken. It was impossible for me to fall asleep until around 2.00 in the morning. Unfortunately they were in the process of doing some renovations which wasn't indicated anywhere on Booking.Com or their website. This meant that we were awoken very early in the morning to the sounds of hammering and other constriction work and we really needed a lie in after 36 hours of travelling. It also meant that there was a lot of dust and other muck in the air and the smell of fresh paint, which played havoc with my allergies. Although the staff were apologetic and offered a discount voucher for our next stay. There wasn't a kettle or tea / coffee making kit in the room, but this was quickly rectified when we queried it. Somewhat better service in the garden as it took quite some time before we were spotted as a guest.